New experimental results show a difference in the way neutrinos and antineutrinos behave, which could explain why matter persists over antimatter. The results, from the T2K experiment in Japan, show that the degree to which neutrinos change their type differs from their antineutrino counterparts. This is important because if all types of matter and antimatter behave the same way, they should have obliterated each other shortly after the Big Bang. So far, when scientists have looked at matter-antimatter pairs of particles, no differences have been large enough to explain why the universe is made up of matter – and exists – rather than being annihilated by antimatter. Neutrinos and antineutrinos are one of the last matter-antimatter pairs to be investigated since they are difficult to produce and measure, but their strange behaviour hints that they could be the key to the mystery. Neutrinos (and antineutrinos) come in three 'flavours' of tau, muon and electron, each of which can spontaneously change into the other as the neutrinos travel over long distances. 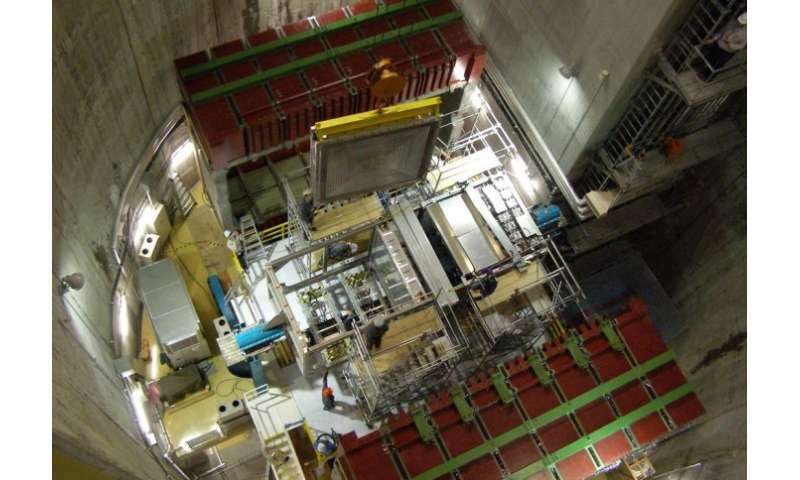 The latest results, announced today by a team of researchers including physicists from Imperial College London, show more muon neutrinos changing into electron neutrinos than muon antineutrinos changing into electron antineutrinos. This difference in muon-to-electron changing behaviour between neutrinos and antineutrinos means they would have different properties, which could have prevented them from destroying each other and allow the universe to exist. To explore the (anti)neutrino flavour changes, known as osciallations, the T2K experiment fires a beam of (anti)neutrinos from the J-PARC laboratory at Tokai Village on the eastern coast of Japan. It then detects them at the Super-Kamiokande detector, 295 km away in the mountains of the north-western part of the country. Here, the scientists look to see if the (anti)neutrinos at the end of the beam matched those emitted at the start. The latest results were concluded from relatively few data points, meaning there is still a one in 20 chance that the results are due to random chance, rather than a true difference in behaviour. However, the result is still exciting for the scientists involved. Dr Morgan Wascko, international co-spokesperson for the T2K experiment from the Department of Physics at Imperial said: "This is an important first step towards potentially solving one of the biggest mysteries in science. "T2K is the first experiment that is able to study neutrino and antineutrino oscillation under the same conditions, and the disparity we have observed is, while not yet statistically significant, very intriguing." Dr Yoshi Uchida, also from the Department of Physics at Imperial and a principal investigator at T2K, added: "More data is needed to prove conclusively that neutrinos and antineutrinos behave differently, but this result is an indication that neutrinos will continue to provide breakthroughs in our understanding of the universe. Upgrades to the equipment that produces (anti)neutrinos, as well as to the detector that measures them, are expected to add more data within the next decade, and determine whether the difference is in fact real. A step closer to solving one of the biggest mysteries in fundamental physics? I agree. Nearly every objection you raise is. Your response & name like this paper, pure fiction. One small problem with the whole premise is that people assume that neutrinos and antineutrinos should act the same NOW, well past the beginning of the Universe. The Matter that the Neutrinos and Antineutrinos is already composed of (positive) polarity and so the normal neutrinos could interact with the matter along the way in a subtle fashion, but one that allows it to change flavors, while the Anti, as soon as it hits matter it destroys itself in a nice flash of light, being unable to interact without destruction, it has to go unchanged unless it should, perchance, come into contact with a small portion of 'anti' type matter of some sort, such as a positron or anti-proton, which is MUCH less likely than the electron or proton interactions possible. Even so, the actual detection rate is extremely low as neither want to interact with matter much anyhow. I'm a proton and electron confinement in free space. Oops there's a field, pick your polarity, the electron and the proton have opposite reactions to the field. When close the near field wins, then loses, then wins, getting further away, springs about to break, ..., then loses. A charge, + or -, or both, flies away behind the created electrical oscillations or high frequency set of wavelets called a neutrino or whatever particle physicist give to these wavelets. Wonder why we think it's so mysterious? How else do you get a wavelet if not by the motion of charge, i.e. the spherical diametrical fields. So what started this oscillation? A pull on each? When was it applied? Was it a constant field? What happens if a similar field is felt by a like configuration? Was there some other motion that caused this oscillation? Was there rotation? Anyway, there are more sane answers than mysteries. One small problem with the whole premise is that people assume that neutrinos and antineutrinos should act the same NOW, well past the beginning of the Universe. Occam's razor: if you assume they act differently over time, you have to add an explaination as to why, and that makes the scenario less likely to be true. So, write them up, publish them, book your tickets to Stockholm, and bugger off there. Try to find a part of town with no internet connectivity. 95 % confidence is 2 sigma only. you need 5 sigma to be safe. True. Could just be a statistical blip, much like the LHC's recent "possible" particle detection. I hope it's not though. It would bring us closer to understanding how we're here, against the incredible odds. When equal but opposite charges combine, stable photons are formed if the miniscule masses are also equal. When threshold gammarays split in "pair-formation" of electrons and positrons, also in equal numbers, supersymmetry is still retained. When we learn what is known versus what is fantasized we will know. Eikka, I was saying that doing experiments Now, in an already (Positive) Universe is going to be weighted towards the side of Positive anyhow, so that (Negative) particles will be affected differently. Should this have been a (Negative) polarity universe then it would be the (Positive) neutrinos that did not change flavors. The problem with the low sigma here is easy to deduce: when you let loose several billion neutrinos at a target and are able to count only a few tens of them, it make it very hard to verify that the effect is at, let alone above the said percentage and thus giving rise to it's Sigma level which is low. Getting really good information about Neutrinos, since they are orders of size smaller than even electrons, is very difficult. When they go through 'detectors' they are lucky to detect 1% of them, even when formed aimed at the detector, most of them will go through without interacting in any way so it has taken them quite some time to find out that it even does come in flavors, and that they can change flavors was a big deal. This, in it's own way is nearly as big a deal, that normal and anti neutrinos act differently, but they are also surrounded by the present (Positive) universe, and so I think that this should have been expected, but it is still easy to see the mechanism. And Eikka, it is just a matter of Fact that any of the various forms of anti-matter that DO show up in THIS Present Universe, do not live long either, since they tend to find their opposite member and self destruct in a blaze of glory. So it is merely applying Occam's Razor in a different direction: How can ANY form of Anti-matter exist for long periods of time in a (Positive) matter Universe? The easy answer: It doesn't. It may exist for a time, as long as it is in vacuum and not affected by photons or other forms of matter/energy from this Universe. But eventually it Will find it's opposite and remove itself. Why should Anti-Neutrinos be any different? But we already know that you are a self-aggrandizing nitwit with a breathtakingly poor understanding of science as displayed by practically everything you write here: we don't have to fantasize to get there. Actually that statement was a tautology, something you missed. I like that you think I'm a nitwit, coming from someone who thinks an absolute truth is nonsense. Thus from "What's the Name of this Book", Smulyan on logic, you must be the non-truth sayer, ie. those who never speak truth; thus, the negation is true, simple logic. This research shows an obvious age prejudice against old-trinos. The universe probably does not have the budget to deal with their retirement. Spent it all on blasting the new ones around in the outer colonies. All while looking innocent and not doing much of anything. Or at least grant existence. The physicists need the "New Physics" for to have something to research and the neutrinos is their main hope by now. Astro-physicists should transition to Astrology & start by posting Horoscope Readings here on PO where there is a ready & willing Rant Brigade of followers to give them 5 Star kudos, & where they stand a better than zero chance of being right about any prognostication they make. ............and Oh yes, I intended but forgot to include in my above post.........Please Astro-physicists, don't send us anymore of your resumes, we just want to hear from competent professionals who actually know something about Nuclear Physics, there's no employment market for the perpetual motion mechanics you guys are trained to believe in. So what theory did you use to make the spectral peaks go away? Not as in disappear, because they are firmly etched into the whole universe and especially our own sky. But for all the evidence to go away. And note, that it doesn't suffice to replace the consensus cosmology of early times. Planck and other telescopes have seen dark matter in various other situations - you have to explain them all before you claim against evidence that dark matter is in trouble. What physicists are doing is not to reject dark matter - they can't, and you can't - but to discover more of its properties. This result was but one step on that road of discovery. ........you must be an Astro-physicist living in a Perpetual Motion Universe , no wonder you never post anything that is tantamount to a cogent thought what with all this contradictory swill of data that you convolute & declare "proof of DM. Go back to your Horoscope readings. .....no, not "physicists", you mean Asto-physicists, learn the difference. The evidence is only evidence of the misconceptions of what is space and something to place it into man's little weak paradigm. Nothing that is or is not, just nonsense that pops into the minds of idiots. There only exist these diametrical miraculous spherical fields, that do not occupy space exclusively, singularly. They cluster then us. Nothing else. So define how that could be while you note, if it is not we would not exist. Else continue with the impossible origins. The universe is a LIMACON (think of a balloon inside of another balloon -- or a loop of string where one end is twisted once and a smaller loop inserted inside the bigger loop). "The expanding known universe" is a matter-type-spin balloon expanding as the anti-matter-spin type balloon is shrinking. The "expansion force" is counteracted by the contraction force of anti-matter shrinking inward. The "dark matter" (or neutral/anti-neutral "imaginary" matter" acts as "filler" which siphons to the "balloon knot" zone where anti-matter is translated into matter), but the only real difference in the two is time/space distance. It is all really simple and obvious if you think of it plainly for a moment. Was the oscillation detected as the neutrinos/antineutrinos passed through matter, such as rock? If so then the experiment should be repeated by only passing through vacuum, to ensure the symmetry of the experiment. It's a logical error to define a world view as analogous to it's constituents.